Kinemalogue: This is a hotel for ants! Wes Anderson's best-looking, funniest film, and Goddamn is that better than good enough. The Grand Budapest Hotel lacks the high emotion of Anderson's very best, but it remains what it is: exuberance and excellence incarnate. With Ralph Fiennes (Gustave H.), Tony Revolori (Zero Moustafa as a young man), Adrien Brody (Dmitri), Willem Dafoe (Jopling), Saoirse Ronan (in a good movie for once), and many, many more! Ah, the 1930s. What a wonderful time to be alive and a European! 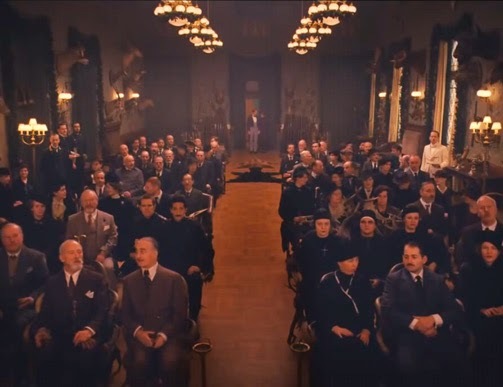 In The Grand Budapest Hotel, which is neither set in Budapest nor to the best of my recollection features a single Hungarian place or person, it's like the Belle Epoque never ended, and the interwar years are pretty good, at least for the wealthy and those who service them (as we learn, by whatever means necessary). But history marches on, even in the alternate universe Wes Anderson's lived in for almost two decades, and storm clouds in the form of fictionalized crytpo-Nazis are marshaling in the far distance. We begin, however, in Europe long after that particular rain and well into another. 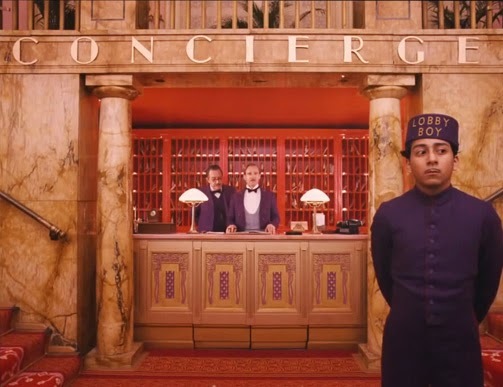 As mentioned in literally every review of Hotel so far written, the most theoretically striking formal gambit made by the picture is Anderson's use of multiple time periods, each conveyed in a different aspect ratio, which means it's like Tron: Legacy, already a tell-tale sign of excellence. The casual moviegoer need not be very concerned with this formalistic fuckery, insofar as the matryoshka doll chronological structure reflected by these different frames is, in its first iteration, entirely pointless; in its second, it is useful only to artificially create the sense of melancholy that is so obligatory to the Wes Anderson Experience but which is also largely organically absent from the third iteration of the nested story. 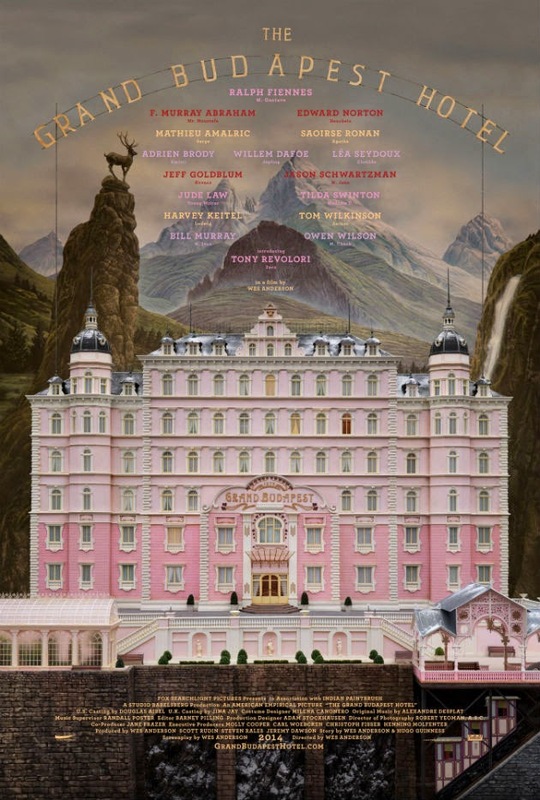 This is the one that matters, as it concerns one Monsieur Gustave H., concierge of the Grand Budapest Hotel. 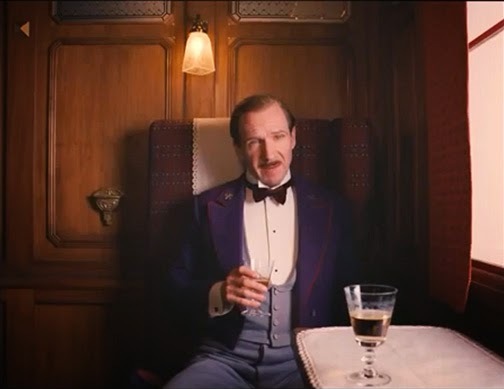 Played with zeal by the super-talent that is Ralph Fiennes, M. Gustave is committed to the comfort of his guests, to appearances and to the substances beneath them. He is at once a gentleman's gentleman and a rich old lady's perfect pantymelt. He douses himself with cologne. And while he can quote from the canons of literature and poetry alike with exacting elegance, he might also be afflicted with a mild form of Tourette's. And they said there was no audience for a live action Pepe Le Pew picture. He is soon joined by the (principal) narrator of our tale, his lobby boy, one Zero Moustafa, who relates their adventures and misadventures during the latter's youth. Their story is shot in 1.37:1, in the manner of movies made before film studios decided to take revenge on an upstart broadcast industry and make most movies unwatchable on televisions for three generations. It's customary to give Anderson credit for a style so fussy, and so unidirectional (if not outright static), that his films border on portraiture, but which also leads to films that are so very perfectly composed. It turns out they weren't perfect yet: the Academy ratio is clearly what Anderson was born to shoot in. Finally his living dioramas have found their ideal box. Perhaps my single favorite shot—not least because it is also probably my favorite joke—is the turn from Anderson's ordinary horizontal axis of movement to that of depth as Gustave, betraying his suave demeanor and cucumber-cool composure, breaks into an awkward sprint into the far reaches of the shot, and almost disappears into the set as the camera stays resolutely fixed to its station. 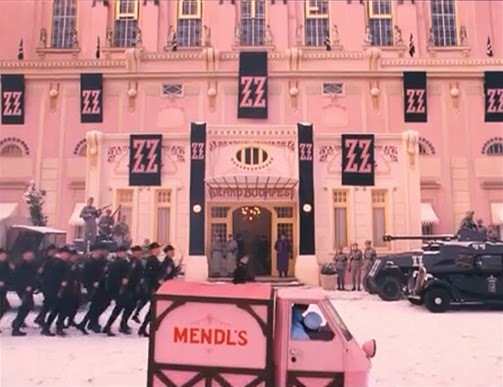 But the film is full of design standouts: I haven't even mentioned yet the cutaway prison, the Grand Budapest Hotel as redecorated in the 1960s, or the museum. In his live-action work, Anderson has had the assistance of three production designers dating from his first visually mature film, The Royal Tenenbaums. David Wasco had previously worked on Rushmore, which contains the unmistakeable signs but does not represent this particular flower in full bloom; together, they brought Anderson's vision of a dollhouse filled with comically dysfunctional sociopaths to life. Mark Friedburg came aboard the Belafonte for Zissou and made the trains run on time for Darjeeling; the former, with special thanks to animator Henry Selick and his realization of the life aquatic, previously represented the crowning triumph of the Anderson style. Now comes Adam Stockhausen, an art director on Darjeeling, who assumed design duties for Moonrise Kingdom, and here presents the Andersoniest Anderson joint of them all. You could be forgiven for believing that Anderson's only ever worked with one designer, such is the nature of his movies (contrariwise, Tim Burton has never been quite the platonic ideal of himself without Bo Welch, and I suspect half of everything we think is Baz Luhrman is, in truth, the inimitable Catherine Martin). The almost standardized look of every one of Anderson's films since Tenenbaums—a style where the devil is in the grand sweep along with details, and even the devils are identical in all but their scale and the story they support—suggests a practically dictatorial control over his designers, leaving them in a truly subordinate, purely executive role, rather than one equally responsible for the vision and success of the film. The discipline's staunchest supporter can't ignore this, even if that supporter thinks auteur theory in its stronger forms is rendered hooey in the face of the rather demonstrable fact that virtually every major feature film is a collaborative efforts between dozens if not hundreds of people, each with their own ideas and competencies. But even someone like that—who sounds an awful lot like someone like me—must compelled to reconsider, if not wonder aloud whether Anderson could plausibly claim a legitimate design credit for himself. Perhaps that was his true calling, and he was merely bad at math and handicraft. 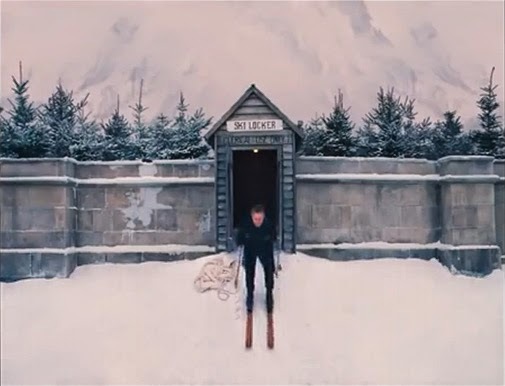 It's also the On Her Majesty's Secret Service of precious miniature action scenes. I've barely mentioned the plot because it is, mostly, an excuse: an excuse for Fiennes et al to embody Anderson's dry comedy of awkwardness, and to launch into elaborately-staged chase and action sequences, and to explore the world created by the surreality of the characters and the hyperreality of the design. It is, in genre, a caper film, more broadly an action-comedy. M. Gustave, who has lavished seemingly genuine attention upon the dowagers in his care, now receives the payback for his good sexual karma, having been named in the will of one Madame D. (Turns out all the old age makeup in the world can, in fact, make Tilda Swinton less hot, though she does fall from a pretty rarefied height.) Gustave is to receive the priceless painting, a fictional mannerist masterpiece, Boy With Apple. Unfortunately, however, her jealous children, led by Dmitri and his wonderful hair, won't have any of this, and have framed the poor concierge for their mother's murder. We move deftly from art theft to prison break-out to final confrontation with Dmitri's implacable assassin, Jopling, in a role which will make you wonder why Willem Dafoe has never played a Terminator, and if it is still not too late to recast and reinvigorate the newest iteration of that dying franchise. In the background, our setting, the fictional nation of Zubrowka (is "Budapest" an adjective? ), steels itself for war with an unnamed adversary, though their real-world analogue is hardly a secret, given that the invasion is spearheaded by, evidently, the fearsome Waffen-ZZ. 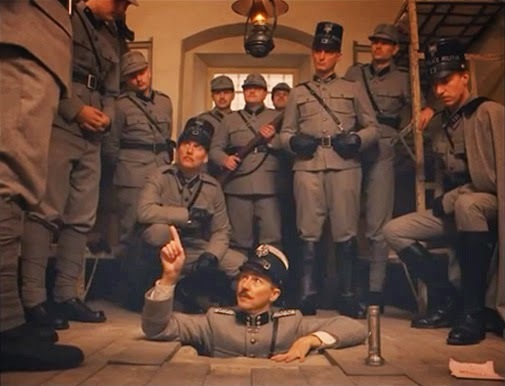 Gustave has occasion to meet with Zubrowka's enemies, and not all of these interactions end well. Even Anderson's Nazi occupation is as cute as a button. I have neglected to mention many minor plot threads, for the film is more complicated than it is complex; they are best experienced in the seeing. In sum, it is Anderson's most persistently funny movie to date (if, perhaps, the most shallowly so). It is also, as intimated, Anderson's goriest film, and the sudden and quite hilarious violence with which Anderson has dabbled in the past and now takes the fore as a crucial component of his comic styling, and earns the important qualifier "ultra." Indeed, Hotel is the most cartoonish film in even Anderson's highly stylized body of work (and I am including, before you open your mouth to correct me, The Overrated Mr. Fox). 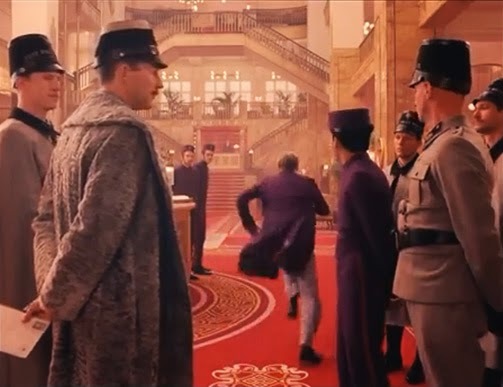 The most important moment in terms of defining the tone and aims of Grand Budapest Hotel is the sequence where Jopling pursues a target through a museum. Forget that the museum is unbelievably gorgeous, considering that it is a series of sets that appear on screen for a grand total of about forty-five seconds. Pay attention instead (I believe I was the only one who did in my screening) to the sign at the museum front desk. As his quarry enters, the hand-changed placards read "15 minutes till close." Two cuts later, Jopling follows; in case you were wondering, and I'm sure you were, you only have 14 minutes left to culture yourself. That brings us back to where we began, the arbitrary framing sequences. While hardly a waste—the scenes in the 60s are as effective at depicting the corroded, mod beauty of the Hotel under Communist rule as anything you might imagine—they seek to establish a sense of faded glory by brute force. This is not one of Anderson's stories about loss and decay; nor is it even a story about hope and growth, as was Moonrise; it certainly isn't both, although arguably it tries to be and fails; but in the end, it's just a story about itself, an entertainment. The attempt to jam his perennial themes into Hotel cannot be entirely successful, as it lacks the fully human containers needed to hold them. 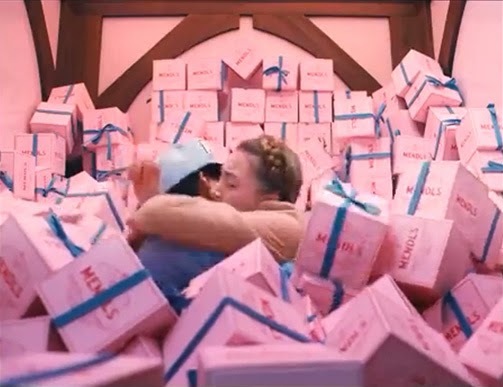 That's nothing to be ashamed of in a movie as resolutely pleasurable as Grand Budapest Hotel. It won't make you weep, but it will make you laugh, and there are worse things than losing yourself so utterly in such a perfectly crafted experience. Oh, that word, "perfection": perfect is always an exaggeration; no collection of shots, called a film, is so flawless that you wouldn't dare change a single one. But Hotel is getting close to that impossible standard—where, literally, fewer shots than you could count on both hands could possibly be improved, and even for most of those only by lengthening them in time, not by any tweak to the arrangement of elements in space. 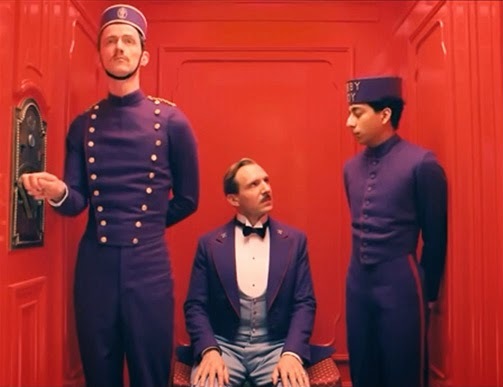 To paraphrase Shelley's appreciation of his own Adonais, Hotel is one of the least imperfect films Wes Anderson has ever made. Noodle that. You don't need to capitalize the "g" in "goddamn." Maybe you should brush up on your Third Commandment.